Son La (Sơn La) is still a pristine land with forests, mountains, streams, majestic landscapes, and the sincere heart and hospitality of the local people. Coming to Son La, visitors will be able to admire the magnificent but poetic scenery that the Mother Nature grants such as Moc Chau plateau (cao nguyên Mộc Châu), Pha Luong peak (đỉnh Pha Luông), Son Moc Huong cave (động Sơn Mộc Hương), and enjoy the fresh air of the highland as well as the aroma of green tea. Now let’s find out 5 must-visit places in Son La, Vietnam for tourists in recent years. Moc Chau plateau is located at an altitude of 1500 meters above the sea level and nearly 200 kilometers northwest of Ha Noi. This large plateau is about 80 kilometers long, 25 kilometers wide with 1600 hectares of grassland. One special feature of Moc Chau is that the middle land of this plateau has its unique climate with cooler summer and drier winter than other surrounding areas, the average temperature is only 20 degrees Celsius. The major reason urging visitors to come to Moc Chau is the beauty of various flower types in their blooming season. Moc Chau during the spring – the season of proliferation, the season of intense vitality, the season of new beginnings – is full of the pure white of “ban” blossoms, plum blossoms, and apricot blossoms interwoven with the graceful pink of peach blossoms. Fall and winter are seasons of red poinsettia blossoms, golden wide sunflowers, and pearl mustard blossoms. You will be amazed standing in front of flower fields spreading all over the hillsides as far as your eyes can see. If you plan to visit Moc Chau in the summer, instead of flowers, this place will make you fascinated with gardens of ripe plums and peaches, and vast green tea fields. With its cool weather, this is an ideal stopover in torrid summer days. One thing to notice is that normally you have to buy entrance tickets for almost every flower field and fruit garden, therefore, find and ask the owners for the rule before touring around. To get to Moc Chau from Ha Noi, you can either drive or take a coach. If you choose to drive, first you have to start from Thang Long Highway (Đại lộ Thăng Long), then go on the route of National Highway 6 (Quốc lộ 6). When you reach Van Ho intersection (ngã ba Vân Hồ), follow directions to National Highway 43 (Quốc lộ 43), continue driving for 23 more kilometers and you will reach Moc Chau. If you do not have an available vehicle, you can catch a Son La coach at My Dinh, Giap Bat, or Yen Nghia station (bến xe Mỹ Đình, Giáp Bát, Yên Nghĩa). One of other must-visit places in Son La, Vietnam is Pha Luong peak. Pha Luong is located between the Vietnam-Laos border, at an altitude of nearly 2000 meters above the sea level and is called “the roof of Moc Chau plateau”. This is the captivating place for those who love exploring. Climbing to the summit of Pha Luong requires courage and endurance as the road is slopping and jungle-coated. However, when you have successfully conquered Pha Luong peak, you will feel proud to contemplate the imposing mountains. In cloudy days, this place is referred to as “heaven” with its fantastic scenery. And because Pha Luong peak is in the shape of vertical cliffs, your view from the top is airy, not obscured by any obstruction. Pha Luong is about 40 kilometers far from Moc Chau. The only way to get to Pha Luong is to ride a motorbike. The road is quite windy and difficult to go, so you have to prepare the map and determine the direction from the beginning, as well as be strong when riding to avoid accidents. Ta Xua (Tà Xùa), Bac Yen district (huyện Bắc Yên), Son La province (tỉnh Sơn La), has long been known as “paradise” for backpacking travelers to “hunt clouds”. 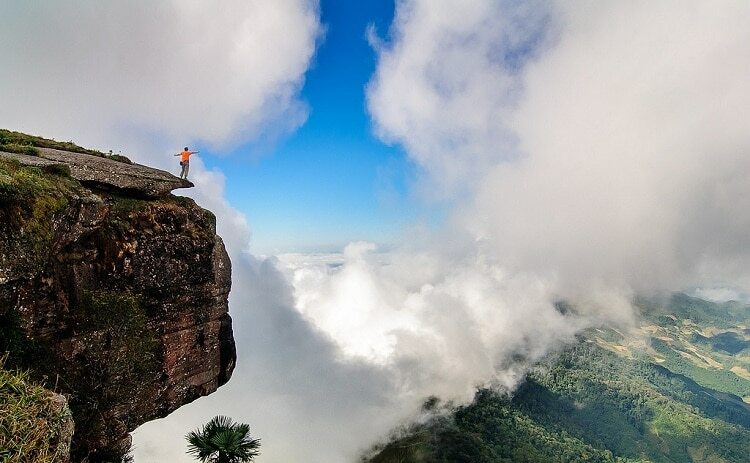 Ta Xua has 3 main peaks, forming a gorgeous natural wonder. The way up to Ta Xua is steep and winding, like the backbone of a prehistoric dinosaur, which makes it one of the most arduous challenges even for people who are passionate about overcoming adventurous climax. Ta Xua is only 100 kilometers from Moc Chau. After crossing the 230 kilometers pass road, you will reach the summit of Ta Xua to immerse yourself in the magical scenery here. Anyone who has ever been to Moc Chau must visit Son Moc Huong cave at least once. If you are wondering, then the name Bat cave (hang Dơi) may be more familiar to you. Son Moc Huong cave is like a work of art, a masterpiece bestowed on Moc Chau plateau. The origin of the name Bat cave is due to the large bat population residing in the cave from a long time ago. Nowadays, the bats have migrated, thence Bat cave in many tourist books owns a more loveliness name: Son Moc Huong. Besides, this cave was also called Sa Lai, which means “water” in the language of Thai people, because there is underground water flowing all year round, which is the water source of Moc Chau people. With its fanciful and exceptional, all visitors to this place agreed that this is the most alluring cave in the west. 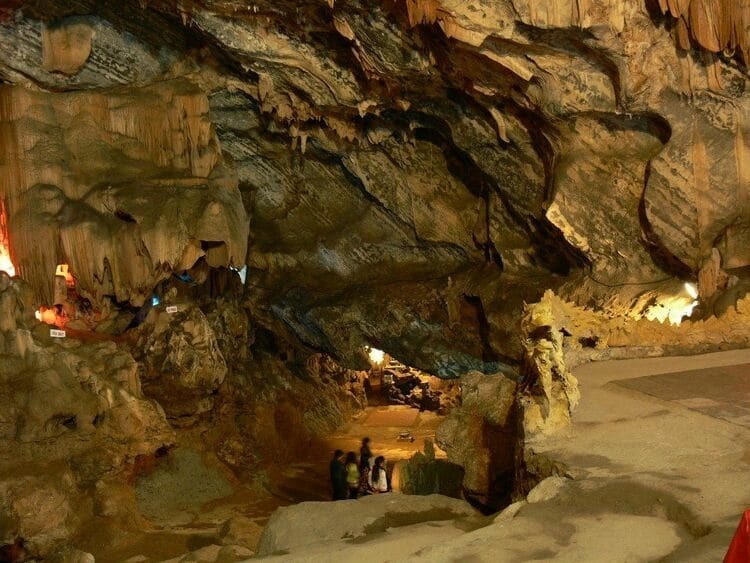 Son Moc Huong cave has been designated by the Ministry of Culture, Sports & Tourism as a national monument. Ang village’s pine forest (rừng thông bản Áng) is a place that you can come in any season of the year. The scenery of the forest is like a canvas with thousands of lush green foliage and a cluster of stilt houses lying near the lake. You will be delighted to take pictures between the enchanting atmosphere and cool climate of the forest. Beneath the pine forest is a valley of purple wildflowers, here is also where the Thai people live. Walking around, you will occasionally see horses slowly eating grass, making the scene more romantic. This is the place you have to set in your plan when coming to Moc Chau and Son La. Above are 5 must-visit places in Son La, Vietnam. This article, hopefully, will make your trip more convenient. For more information about other attractions to visit in Vietnam, go and check our vina site.